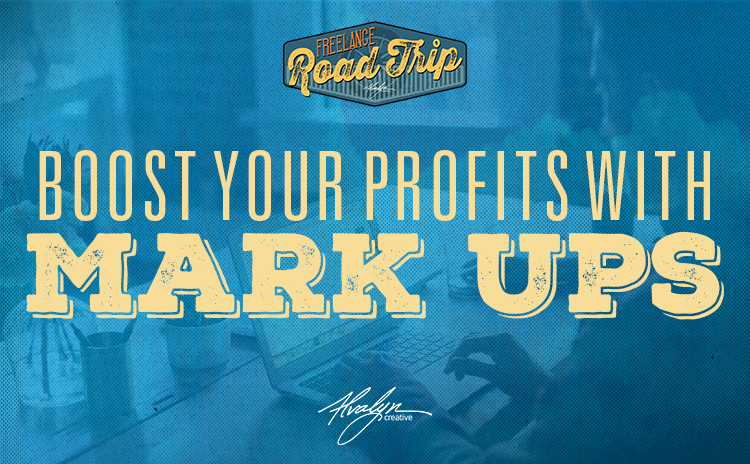 A mark up, also known as percentage over cost, is one way you can increase your freelance revenue. There is nothing unethical or untoward about applying a mark up on your expenses. You’re not ripping off your client. Managing the expenses related to a project is an additional service to the client. If you are not brokering add-on services such as printing for your client, you are missing out on opportunities for additional revenue. If you are not brokering add-on services… you are missing out on opportunities for additional revenue. Here’s how the mark up works in the case of a print design project. The designer schedules the printing, prepares the files, reviews the contract proof, does a press check, checks the finished work for quality and overseas delivery of the printing to the client. The printer bills the designer for the job. The designer then bills the client for the expense plus an added percentage over cost — the mark up. In the case of a freelance photographer, a shoot may require the help of photographer’s assistants, stylists, equipment rental, stage rental, prop rental, licenses, and permits. These these are all subcontracted services for which the photographer should add a mark up when billing the client. The mark up is not necessarily for the time involved on the part of the designer, because that can be addressed with a project management fee. The markup is for the risk. A good reason to mark up your costs is because you’re assuming the financial risk. Since the printer is billing you, you have the obligation of paying the bill whether or not the client pays you. Because of the risk alone, a markup is appropriate and expected. The markup is for the risk. If the client uses their own printer and the designer is not taking the risk for the printer’s invoice, no mark up would be added to the invoice total. But the designer can (and should) charge a project management fee in addition to their creative fees. In my freelance business I charge a management fee and mark up the expenses for every project. Remember, the mark up is for my risk, not my time or effort. Marking up is an art. If the practice makes an expense prohibitive for the client, that’s not going to be beneficial for the designer. In order to apply a markup to an expense, the designer should negotiate a trade or wholesale rate with their suppliers. That will allow the room to mark up. Trade rates are lower then retail, and are a courtesy many printers provide to designers so that the designers can profit off the cost of the job. Printers actually expect you to mark up the job. How much should you mark up? A mark up can range anywhere between 10% to 30% or more. I would guess that for most freelancers it’s about 20%. I use a sliding scale between 20% and 33%, charging a higher percentage on lower cost jobs. The reason for that is that large print runs can cost many thousands of dollars, and a 25% markup would be quite unreasonable. I also have a dollar-amount cap on my mark up percentage. I don’t mark-up more than that amount. When you mark up, you don’t need to tell the client that you’re marking up expenses. Sometimes they’ll ask about it, and then you should discuss it with them. Don’t hide the fact that you do. When you provide an estimate in advance of any expenditure — which is something you should do because it’s professional and a good business practice — the estimated expenses should include the mark up percentages. That way the client knows what to expect and will not be surprised when they get your bill. Always communicate in advance what the what the full costs of the project will be. That way the client also knows in advance and can approve the expense before you commit to it. Work with suppliers who will offer you a trade rate. Find suppliers who are happy to offer you a discount so that you have room to mark up. As I said above, some suppliers expect that you’ll be marking up, and will offer you a lower job cost than they’d offer if working with the client directly. It’s a trade courtesy. Should you mark up online printing? A few online printers offer trade rates, but online printing at retail is generally less expensive all-around than brick-and-mortar printers. This is because they gang multiple jobs together in a single print run. (Try sending a custom job to an online printer and you’ll find out they are more costly in that case than working with a printer face-to-face.) I see no reason why you would not mark up online service costs. Work only with reliable suppliers who provide quality work. Some suppliers will discount to you but also discount the quality of their work. I’ve had this happen a number of times when negotiating a lower print cost for non-profit clients. The work’s been delivered out of register, or trimmed incorrectly, or there’s ink splashes on many of the pieces. So be sure the suppliers you work with care about the quality of their work. Become a loyal customer of the suppliers who offer you lowered rates. I’ve been able to ask for and get lower costs on many services because I’m a repeat customer. If the supplier does good work and is reliable, stick with them and build a good, long-term relationship. They’ll appreciate your loyalty and will be able to work with you on trade rates. Provide estimates in advance of expenditures. In your project estimates, state the total marked-up costs so that the client knows what to expect. Again, you don’t have to show the original cost plus the markup percentage, just show the marked up total. For example, if I’m brokering a web hosting service that costs me $79.97 for the first year, I will show that cost to the client as $106.37, which is the total of the cost plus the 33% mark-up. I will not separate out the actual cost and the mark up amount. Be consistent in how you apply your mark up. If you’re going to apply a mark up, always apply a mark up. Too many freelancers confuse things for themselves by having too many conditions for when they will apply a mar kup. For example, one designer applies a markup only if they bill the client after the job’s delivered, and never marks up expenses when working with non-profits. Make it easy on yourself and set a policy that works for every client, and then stay consistent. Remember, it’s your business. So, don’t leave money on the table. Implement a mark up policy! By managing all aspects of a creative project for your client, you are simplifying the process for them and relieving them of the burden of ensuring a quality result (because you’re assuming that burden.) And you are increasing your profit on each project at the same time.